Missing teeth, putting it mildly, can be a real pain. They can make speaking feel awkward, limit your food choices, and over time, drastically decrease your dental health. When it comes to tooth replacement, while crowns, bridges, and dentures are fantastic, they all pale in comparison to the benefits offered by dental implants. At Bristol Family Dental, you can get complete implant dentistry under one roof thanks to Dr. Ross Katkowski and Dr. Karina Goykman. 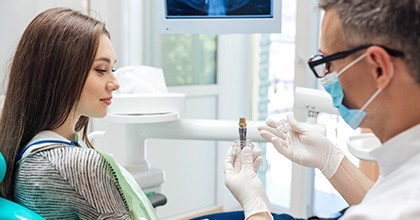 While most other practices will need to refer you to another office to get dental implants placed, our team can actually take care of everything ourselves so you can fill in the gaps in your smile even faster. If you think dental implants are the permanent solution your smile needs, be sure to contact our office today for a consultation. We’re also happy to serve patients from Plainville, Farmington, Burlington, and Southington. Dental implants are a restorative solution that can do what no other procedure can: recreate your tooth from root to crown. To do this, a small titanium post will be placed directly into your jaw, and this will be used to support a variety of restorations that can replace everything from a single tooth to a full set of teeth. Dental Implants are placed over the course of two treatment phases. During the initial phase of treatment, we will surgical place the implant posts. This can sound a little off putting to patients, but the placement surgery is minimally invasive and completely comfortable. We make a small incision in the gum tissue where the implant will be placed. Then, we attach a protective cap. This small cap allows the implant to fuse with the gum and bone tissue and it saves the place for the attachment of the replacement tooth or teeth. In some cases, we’ll place a temporary tooth replacement, so you don’t have to be without teeth during the healing process. It can take between three and six months for dental implants to fully fuse with the gum line. Once the implant has completely connected to the supportive structures, we’ll remove the protective cap and place abutment posts. Then, your final tooth replacement restoration is designed. Dental implant restorations are held in place with titanium, meaning that once you have your new teeth, they won’t be going anywhere. The biocompatible material even bonds to the surrounding jawbone just like your natural teeth. The restorations used to complete dental implants will be made of dental porcelain. This material completely mimics a tooth in both strength and appearance, and because it is rooted within your jaw like a real tooth, there won’t be any obvious signs that you’ve had dental work. Dental implants support your jaw just like real teeth, which will help maintain your oral health for years to come. With routine brushing, flossing, and checkups, your dental implants can easily last for 30 years or longer. Many patients keep their implant supported restorations for the rest of their lifetime.